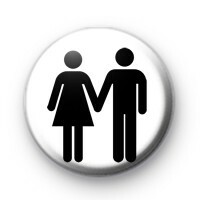 A white 1-inch button badge with a man and women holding hands. The badge is a play on the symbols used for male & female toilets and is a super fun way to show your love. A simple black and white pin badge. All our pin badges are handmade in the UK and we have a huge selection of designs in our shop.